Noah Brown appeared most recently on Show 163, recorded in July 2007, at age 16. He also performed on Show 151. 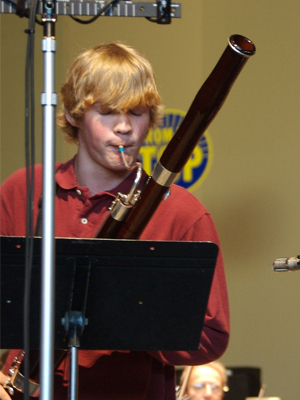 Noah Brown (bassoon), 16, will be a senior at the Interlochen Arts Academy in Interlochen, Michigan in the fall. Noah, originally from Iowa City, Iowa, began his musical career at a very young age as a pianist. Today he plays bassoon in the Interlochen Arts Academy Orchestra and an ensemble called The Destroyers. In addition to music, Noah’s interests range from studying mathematics, French and English to playing ultimate Frisbee and practicing meditational running. Noah is a Jack Kent Cooke Young Artist.